The researchers, from Columbia University's Lamont-Doherty Earth Observatory and other institutions, found that both distance and topography play a role. In lowland drinking wells within one kilometer (about six-tenths of a mile) of a drill site, they found higher levels of dissolved calcium, chlorine, sulfates and iron. 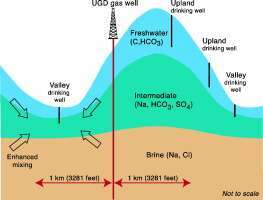 In lowland wells more than a kilometer away, they found higher levels of methane, sodium and manganese compared with equally distant wells on higher ground. Upland wells within a kilometer of a drill site showed no specific trends. Lead author Beizhan Yan, a Lamont-Doherty geochemist, said, "The finding suggests increased mixing of different groundwater sources." This could be due to several possibilities, he said. For one, the sudden, powerful pulses introduced by fracking might act like a pump, expanding and contracting subterranean spaces, and squeezing the contents around. This stress could propagate up to the surface and initiate mixing of groundwater, either from the sides or below, he said. The observations might also be due to leaky well casings at shallow depths, or spills of fracking fluids on the surface trickling down, he said. Study coauthor Steven Chillrud, also a geochemist at Lamont-Doherty, said, "We don't really know what the mechanism is, but this shows there's an impact related to distance. It's an intriguing signal that really needs to be followed up on." 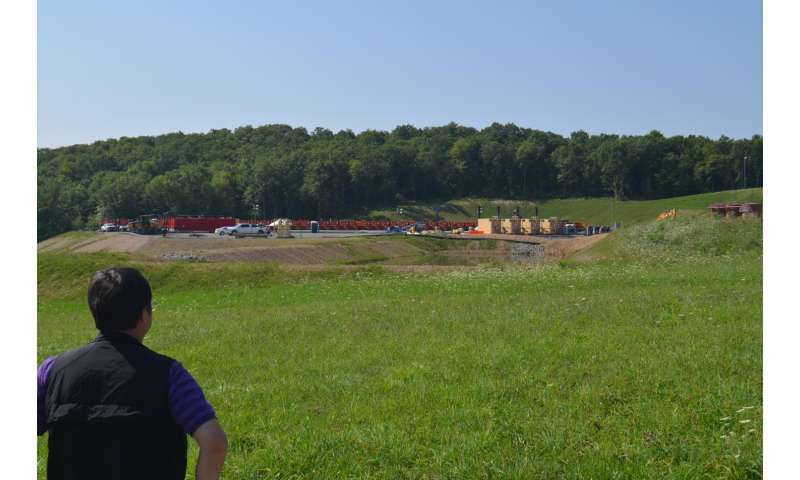 Fracking did not start up in northeastern Pennsylvania until 2007, but now the region has thousands of wells. Chillrud noted that pollutants can take years or decades to move into an aquifer. "If it's from below, that could be an indicator that other, more problematic elements will be coming through at some point," he said. Coauthor Reynold Panettieri, a physician who directs Rutgers University's Institute for Translational Medicine and Science, said none of the substances seemed to be at hazardous levels. However, he said, the different water chemistry nearer the fracking sites "seems to be a fingerprint of drilling. It gives us a map of hotspots that could potentially concentrate toxicants in the future." The study adds fuel to the ongoing national controversy over the safety of fracking. The U.S. Environmental Protection Agency issued a draft report last year citing scattered instances where water had been contaminated, but finding no evidence of what it called "widespread, systemic impacts." Separate studies in Texas and Pennsylvania have found that in the few instances closely studied, when water does get polluted, cracked well casings or spills, not the fracking process itself, have been to blame. Paul Heisig, a hydrologist with the U.S. Geological Survey, said the study raises questions that merit further research, but that no firm conclusions could be drawn. He pointed out that the industry data used in the study lack controls including the depths of sampled drinking wells, and variations in nearby land usage aside from fracking that could affect water quality. "The study points out there may be some issues, but it really needs to be pursued with more data," he said. The study appears this week in the journal Science of the Total Environment. Other coauthors are: Martin Stute and James Ross, also of Lamont-Doherty; Matthew Neidel and Xinhua Liu of Columbia University's Mailman School of Public Health; Brian Mailloux and Lissa Soares of Barnard College; and Marilyn Howarth and Pouné Saberi of the University of Pennsylvania.